← Queen – Long Away. Queen – The Millionaire Waltz. Publicat pe 30 iunie 2015	de Cristi M.
The band drew artistic influence from other British rock acts at the time, such as the Beatles, Cream, Led Zeppelin, Pink Floyd, the Who, Black Sabbath, Slade, Deep Purple and David Bowie.Queen composed music that drew inspiration from many different genres of music, often with a tongue-in-cheek attitude.The genres they have been associated with include progressive rock, glam rock, hard rock,heavy metal, pop rock,psychedelic rock,blues rock and dance/disco. Queen also wrote songs that were inspired by genres that are not typically associated with rock, such as ragtime, opera, gospel, vaudeville, and folk. In 1963, the teenage Brian May and his father custom-built his signature guitar Red Special, which was purposely designed to feedback.Sonic experimentation figured heavily in Queen’s songs. 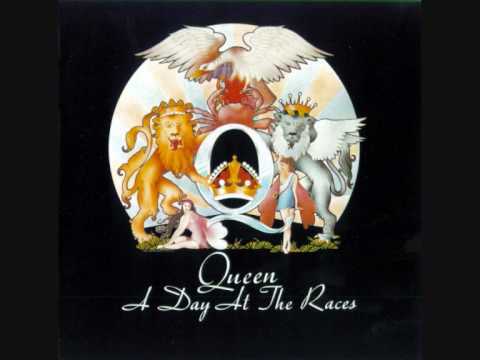 A distinctive characteristic of Queen’s music are the vocal harmonies which are usually composed of the voices of May, Mercury, and Taylor best heard on the studio albums A Night at the Opera and A Day at the Races. Some of the ground work for the development of this sound can be attributed to their former producer Roy Thomas Baker, and their engineer Mike Stone.Besides vocal harmonies, Queen were also known for multi-tracking voices to imitate the sound of a large choir through overdubs. For instance, according to Brian May, there are over 180 vocal overdubs in „Bohemian Rhapsody”.Many Queen songs were also written with audience participation in mind, such as „We Will Rock You” and „We Are the Champions”.